As I listened to the political debate and working out the calculation on who will emerge as the eventual winner of the Delta North Senatorial aspirant between the two main contenders, Rt. Hon. 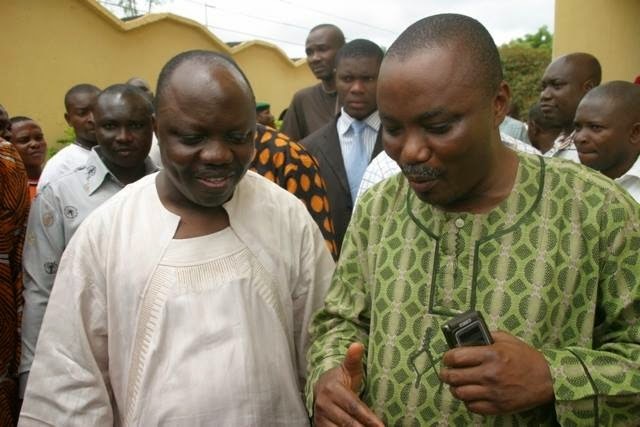 Victor Onyekachi Ochei and Mr Peter Nwaoboshi, the lawyer who could not make it and became a politician; it became as clear as water that the election is between Ochie and the Peoples Democratic Party (PDP), not their candidate Nwaoboshi, one of the worst product to ever market in political history. Oracle as Nwaoboshi is widely called pass across as one man who has seen it all in politics, but for fear of the unknown, just like Tony Anenih has refused to contest for any electoral positions. Such men know themselves that they are only good to be appointees and not elected officers. Such men know too well that they are greedy, selfish and arrogant and therefore do not deserve the peoples vote, hence they can commit all the evils of politics. Sadly enough, the only constant thing is change which has caught up with the oracle himself, who rather than stay comfortable with being an appointed government official decided to throw his gloves into the boxing ring. In his own words, 2015 makes it thirty five inglorious years of being a politician, with nothing concrete to show to his people. He is hated by over 90% of Anioma who will rather have him beheaded by the ISIS than have him near any elective positions where he will decide their fate. He is so greedy that all that matters to him is his own relevance and what benefits his pocket. His inordinate quest for wealth stands taller that the Mount Everest, which is threatening to consume him as the Wild West wind. How he made his money which has been used mainly for his family and not the people he stole from remains a discourse for another day. As the State PDP Chairman, his people have placed a silent curse on him for convincing many Anioma indigenes into picking Chairmanship and Councillorship forms during the last Local Government elections, with promise to deliver them, but like the evil Maradonna he is, he dribbled them, pocketed their money and finally installed his preferred stooges into such various positions. In Oshimili North where he hails from, he is the lord of the manor and king of the boys, deciding who gets what, but not without stringent conditions. His current stooge, Louis Ndukwe who is the Council Chairman is already weeping secretly on what has befallen him, since he was installed by Oracle. Out of the N67 million Federal allocations for November 2014, a whooping sum of N10 million was paid to Nwaoboshi, in an undisclosed agreement, revealed a source. And this amount is paid EVERY time allocation comes to the treasury. The argument that the loss of Nwaoboshi as it’s becoming glaring will have a negative effect on Senator Ifeanyi Okowa’s victory is a tale best told to children under the moonlight in the village, and certainly not intelligent kids who knows that Okowa’s victory transcends earthly conquest but divine, but told to dull brains who can believe anything. Nwaoboshi as its certain is currently grappling to win even the support of his family members, who are convinced that he is not the best material to send to the Red Chambers. A vote for him is a vote for greed; a vote for him is a vote for legislative incompetence; a vote for him is a vote to continue the illegal looting which has been done over the years, and certainly, Delta North who have already experience tremendous development with laudable bills in just four years of Okowa becoming a Senator cannot afford to go back to her inglorious days. The argument that it will be shameful for Okowa to lose his Senatorial District is another lie conjured by the few followers of Nwaoboshi who already sees their master losing and has to coin up psychological analysis to persuade die hard supporters of Okowa into supporting them. As an unbiased Journalist, I remain unapologetically a PERSONALITY supporter and not a PARTY supporter. Okowa has gone beyond the realms of the natural to supernatural that a loss of Nwaoboshi will not remove a SINGLE vote from the over 80 percent votes already garnered by the political maestro. In case they wish to be reminded of history, the current Senators representing Imo and Nasarawa State governors’ Senatorial districts are opposition members, despite the popularity of the duo. No one can be more arguably popular than Rochas Okorocha in this political dispensation, yet his people voted against his choice of a Senator, nor can anyone love Buhari more, yet they voted for Al Makura as a governor, but rejected their Senator, even losing in their own Local Government. A replica of this happening in Delta North, where Okowa will win flawlessly and Nwaoboshi losing shamefully should therefore not come as a surprise. He who laid his bed well sleeps comfortably, and while Okowa has prepared his for this moment, the latter has laced his with nails and should lie on it that way. Delta North cannot be coerced into the lazy men argument of PDP all the way and therefore allow a man like Nwaoboshi who has impoverished his people to enjoy such benefits. I do not want to remind him of his infamous role played during the rave making Sir Tony Obuh political storm, where he almost scuttled the very ambition of the humble man, whose back he is riding on today to fame. His daily boast that he will win convincible because Okowa cannot afford to lose his Senatorial district should be told to area boys under the bridge in Oshodi, as this election is every man to your own tent oh Israel. The underground mansion he is alleged to be building must not be completed with the constituency allowance meant for the people, neither should he be allowed the privilege of using his newly established cable company into being a conduit pipe of getting inflated contracts from the Senate. PDP may be the leading party in Delta State, but opposition parties like Accord and the defunct All Nigeria Peoples Party (ANPP) have won elections in Delta North, just as Democratic Peoples Party (DPP) have also mesmerized the landscape. The signal from the field is clear that he cannot win the election without the effect of Okowa who remains the only reason his name is still being heard today in some quarters. Remove the Okowa factor and we have a man whose political breath is gone. Ochei may not be the best bet now, but out of the two devils, Ochei remains the Angelic devil.